A LP that was to be the turning point in music history several years later when Africa Bambata took the title track and transformed it in Planet Rock. The follow-up to Autobahn, Radio-Activity, had been met with slight bemusement and greatly reduced success. 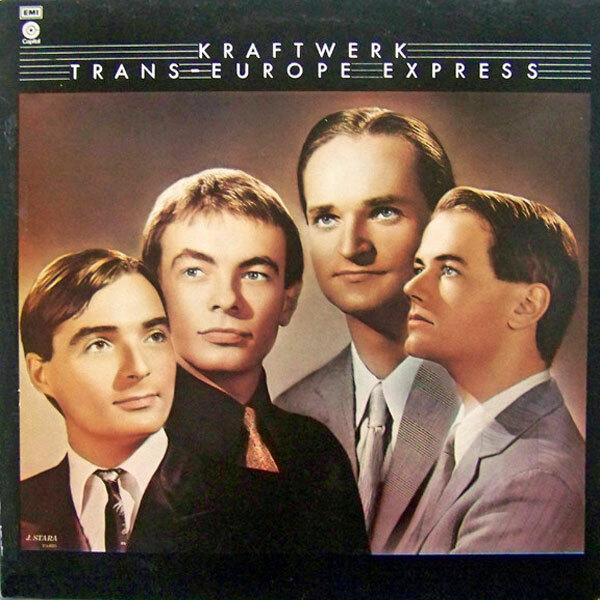 Trans-Europe Express could be seen as a make or break record. The pressure was on, and so, Kraftwerk had to respond. And they did! 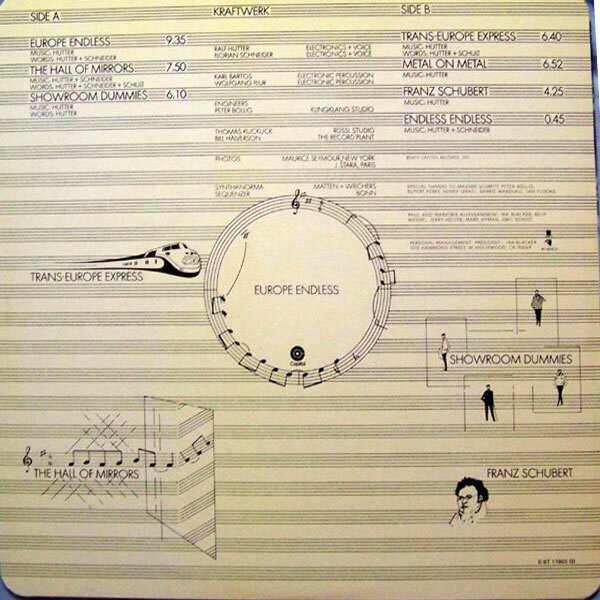 The album has been seen by many as having two themes. One, a celebration of Europe and the other then disparities between reality and image. Musically the songs focus on electronic mechanized rhythms, minimalism, and occasionally manipulated vocals. 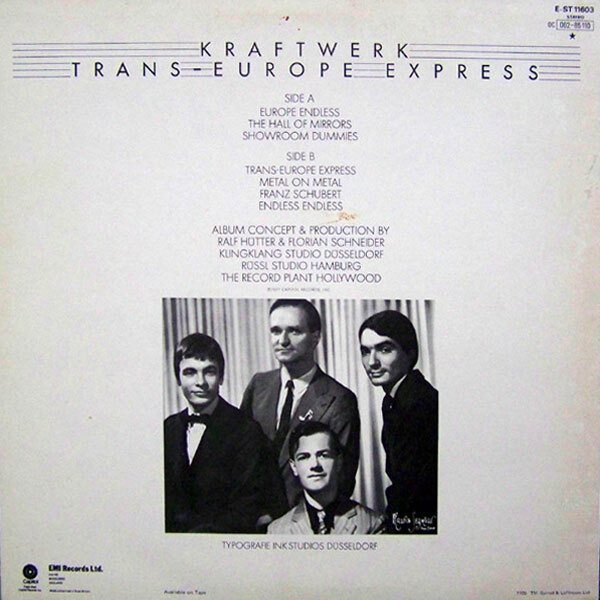 Two singles were released from Trans-Europe Express: “Trans-Europe Express” and “Showroom Dummies”. 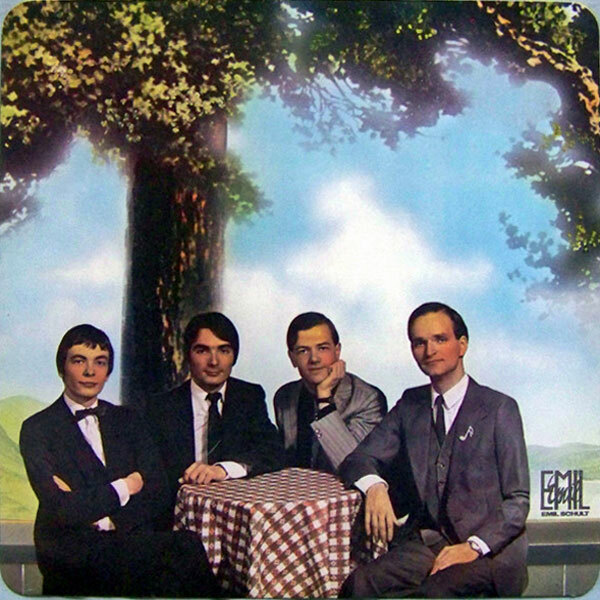 In 2014, the LA Times called it “the most important pop album of the last 40 years.” Ralf Hutter and Florian Schneider met with musicians David Bowie and Iggy Pop prior to the recording which influenced song lyrics. Maxime Schmitt (Capitol Records’ label manager at Pathé Marconi EMI. He was given the job of promoting Kraftwerk to the French public. He soon became a close friend of the group as well as an advisor and collaborator) encouraged the group to record a French language version of the song “Showroom Dummies” which led the group to later record several songs in French. Sal Cinquemani of Slant Magazine described the album’s influence as “unprecedented, reaching as wide as rock (Radiohead’s Kid A), hip-hop (Afrika Bambaataa’s classic “Planet Rock”, Jay Dee’s recent “Big Booty Express”) and pop (Madonna’s Drowned World Tour, which incorporated samples of “Metal on Metal”)”.